Laser surgery is surgery that uses a beam of laser light, rather than other instruments, to cut, dissect, remove, and so forth. The beam of light has advantages over other cutting instruments, such as scalpel or scissors. First, at the same time that it cuts, it tends to seal off tiny blood vessels and reduce bleeding. Second, it may be especially useful in endoscopic surgery, where there is not a lot of room for instruments. Third, it is very precise. Both the microspot carbon dioxide laser and the RevoLix laser used at our practice have minimum spot sizes of about 1/5 of a millimeter. Twelve weeks after removing the hemorrhagic polyp via thulium laser. View under standard light, at the pre-phonatory instant. Both the patient and physician regard the patient's voice as completely normal in quality and capabilities. During phonation, with vibratory blur. Standard light. View under strobe light. During phonation, at the closed phase of vibration, for the pitch B-flat 4 (~466 Hz). Open phase of vibration, also at B-flat 4 (~466 Hz). 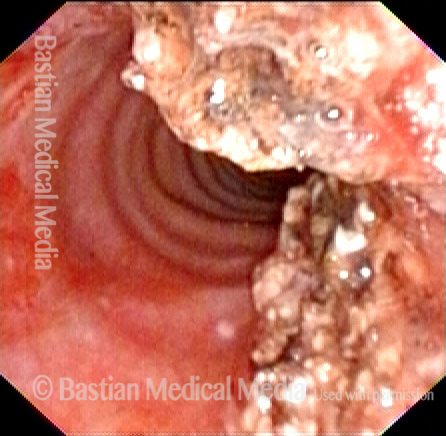 Hemorrhagic polyp, right vocal cord (left of image). This professional singer has struggled with severe limitations for six months. Note the feeding vessel, both anterior and posterior to the polyp, at arrows. These will be the first target of treatment. 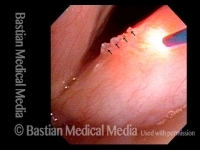 Using near-contact mode with a thulium laser, the feeding vessels have been coagulated, to reduce bleeding when the polyp itself is addressed. In contrast to what would be seen with a pulsed-KTP laser, one can see here hazy superficial coagulation affecting epithelium surrounding the vessels—so superficial that it will not affect vibratory flexibility. The remaining laser energy is delivered to the polyp in contact mode, while stretching it away from the cord. At the conclusion of the procedure, the polyp is released from the fiber. 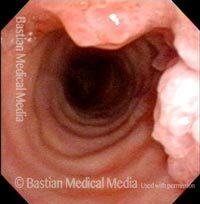 There is no damage to the vocal cord surrounding the polyp. A follow-up visit will be scheduled as "possible laser," in case there is any residual polyp that did not slough off. Bilateral capillary ectasia, made to stand out with the help of narrow-band illumination. At the conclusion of pulsed-KTP laser coagulation, performed in a videoendoscopy procedure room with patient awake and sitting in a chair. Six weeks later; the capillaries have vanished, as expected. The needle shaft is seen at close range, infiltrating local anesethetic (lidocaine) into the vocal cord because the procedure is too uncomfortable to do with topical anesthesia alone. At the beginning of this "aggressive" laser procedure. The blue fiber is delivering thulium laser energy to coagulate the abnormal tissue. These vocal cords lost their ability to vibrate long before this procedure. At the conclusion of this episode of treatment, aggressively coagulated tissue which will slough off in coming days and weeks. Six weeks later, at beginning of next thulium laser treatment. Near the end of this subsequent thulium laser treatment. Years ago, papillomas covered both true cords. After many surgical and adjuvant treatments, the disease has for several years been virtually in remission, and his voice stable and near-normal. This single, asymptomatic lesion is being addressed "In the chair" under topical anesthesia. Narrow-band light and a closer view make the lesion and its true cord extension more evident. In the lower left of the photo, the main lesion and true cord extension have been coagulated. 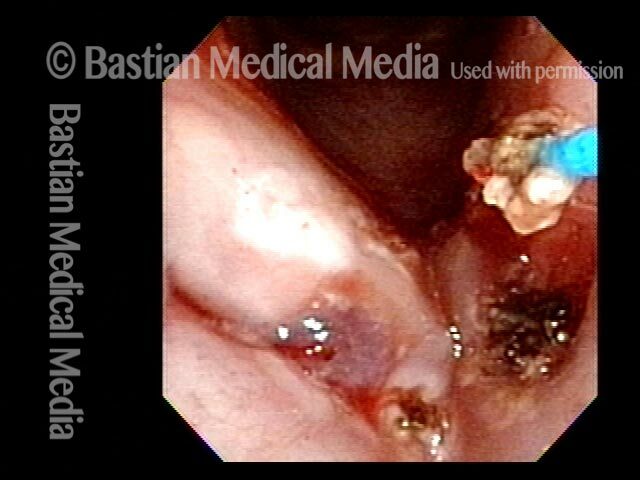 To finish up, contact mode (while the fiber was touching and even spearing the lesion) has coagulated more deeply the false cord component that does not threaten voice. Pre- and post-procedure voice are unchanged and the coagulum will spontaneously detach within the next few days. Open position for breathing, standard light. 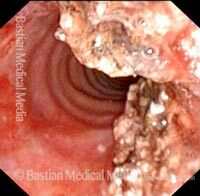 There is capillary ectasia on both vocal cords, and there is also a hemorrhagic polyp of the left vocal cord margin (right of photo). 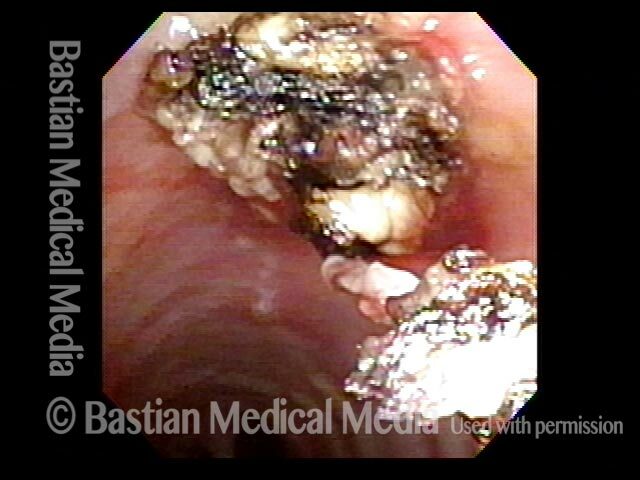 During voicing, the polyp interferes with accurate approximation of the vocal cords, which explains this man's chronic hoarseness. Using the thulium laser to spot-coagulate and interrupt the flow in dilated capillaries. 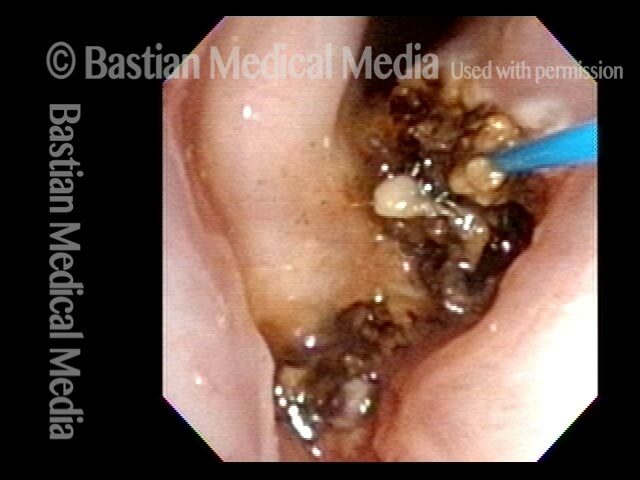 Coagulation of the polyp, with fiber tangential to the vocal cord and sometimes lifting medially during contact mode. 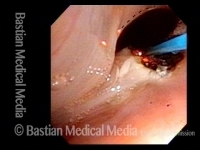 A second, similar procedure was needed a few weeks later, only for residual polyp. 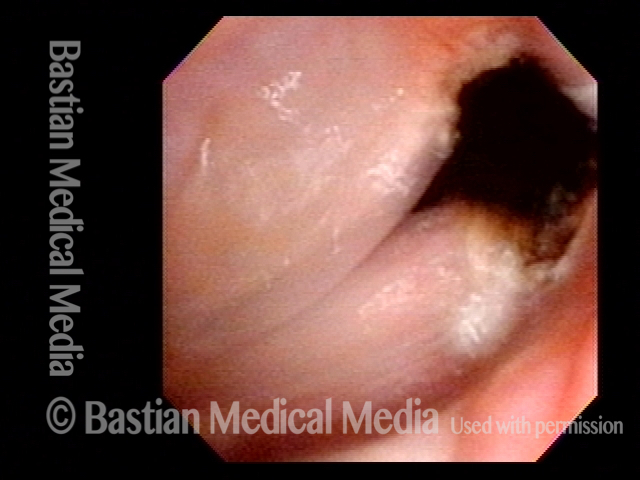 Several weeks later, capillary areas are blanched, but the vocal cord mucosa is fully mobile. Vocal cord margin match and mucosal flexibility are best tested in high voice. This is strobe light, closed phase of vibration, at F4 (~349 Hz). Also at F4 (~349 Hz). The mucosa of both cords is completely supple. The patient considers his voice to be perfectly normal—"original equipment." High tracheal papillomas from HPV subtype 11. If allowed to grow, these eventually cause airway symptoms. This is one of many procedures to keep these papillomas in check. After thulium laser coagulation, using not only near-contact mode, but also after inserting the fiber into the substance of the papillomas repeatedly. Most of this material will slough away in coming days. This elderly man is tracheotomy-dependent due to inability to open the vocal cords. Here while breathing in, there is a posterior “keyhole” from the divots caused by pressure necrosis of the breathing tube. Still, due to inspiratory airstream, he produces involuntary inspiratory voice. General anesthesia for laser widening of the airway (posterior commissuroplasty) would be very risky due to his diabetes and many other medical problems. Hence, the decision to attempt this with patient awake and sitting in a chair. The posterior right vocal cord is injected with lidocaine with epinephrine, in preparation for office laser posterior commissuroplasty. F = false vocal cord. T = true vocal cord, near its posterior end. The left vocal cord is injected similarly prior to the procedure that follows. The thulium laser fiber is being used to excavate the posterior commissure. 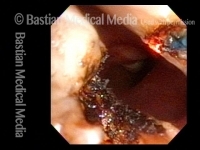 Note the existing divot of the opposite (right) vocal cord (dotted lines) which will also be enlarged (next photos). With view rotated clockwise approximately 45 degrees, work is commencing to deepen the right vocal cord divot. At the conclusion of the procedure. 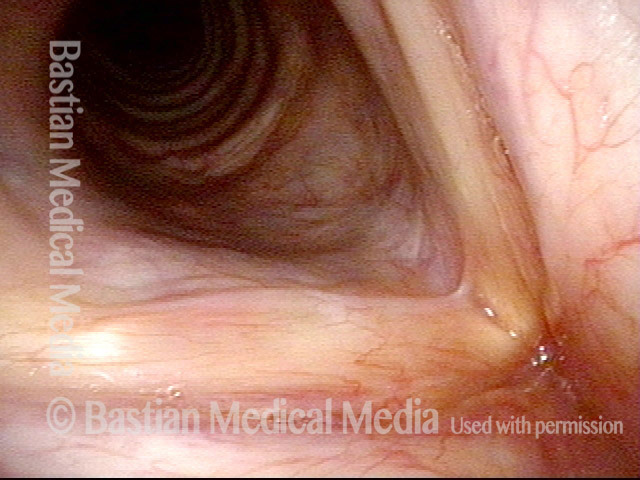 Not only is the ‘keyhole’ seen in photo 1 larger, but inspiratory indrawing of the rest of the vocal cords is greatly diminished. Now phonating, voice is similar to the beginning of the procedure, because the vibrating part of the vocal cord was not disturbed. Of course, number of words per breath is slightly lower, due to increased use of air through the keyhole—air wasting. 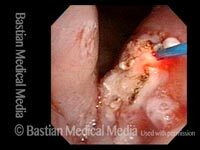 This video gives an example of office-based thulium laser ablation of residual laryngeal papilloma. This entry was posted in Multimedia Encyclopedia and tagged Other useful terms, Photos, Treatment by admin. Bookmark the permalink.